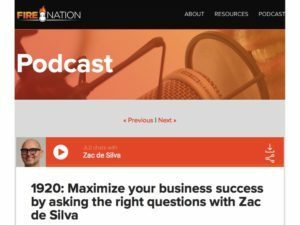 In late January, Zac spoke with John Lee Dumas (JLD) who hosts the # 1 award winning business podcast, Entrepreneur On Fire. Some real legends have been on this podcast like Tim Ferriss, Tony Robbins, Gary Vee, Barbara Corcoran and our own Rod Drury. Zac does not share often about his entrepreneurial journey to date but with JLD, has a candid chat on how he got to where he is today along with sharing some gems on how to be more successful in business. Enjoy the podcast.